That’s the advice from Sugar Ray Leonard, motivational speaker — former boxing champion — and pretty fantastic person. 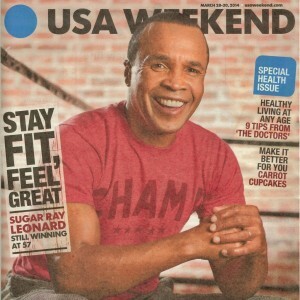 The USA Weekend, March 28-30 featured Sugar Ray in its “Special Health Issue.” He was promoting staying fit, exercise and eating well, as you might expect, and then came up with this gem when asked about his fountain of youth. Great! Those sound good to me, a good mix. I don’t think the intention is to limit the choice of paths to one and done. Retirement begs for choices. I like their questions and the idea of planning for retirement. A mission statement, OK, but make that general enough to allow for options. 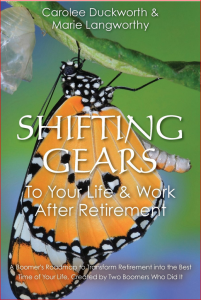 The Amazon.com blurb on their book, “Shifting Gears to Your Life and Work after Retirement,” added some further insight . . . The idea that being ‘engaged’ is a source of well-being — feeling good — is really just a continuation of being engaged in one’s work. My best experiences in the workplace were when I was involved with colleagues creating something, helping someone, doing stuff and enjoying doing it together. I think that’s the idea of ‘community’ in the workplace, a source of significant competitive advantage. The idea here is that it continues to be a source of advantage in retirement. So, we should be doing some dreaming of the possible; then some redesign to stay engaged, stimulated, and involved. Great stuff, but, it’s not just about us individually. As suggested by the path options, the challenges for the possible can also be found in contributing time and talents to others, students, soldiers, sick, aged, family, . . .
What do you think? Have you found your challenge for the possible? Please share your experiences in the Open Forum. One of your colleagues might be looking for just the thing you know best.